The shipping industry is continuously evolving. Everything from the global economy to geopolitical events and technical innovations pose new challenges and opportunities, which must be properly understood and managed. Building profitable shipping entities and securing long-term competitive advantages have always been challenging. Decision makers often have limited time and struggle with an overload of fragmented information. However, many companies have faced the same challenges and adopted a number of different solutions and strategies with a varying degree of success in the past. Learning from their experiences and building on their successes saves time and produce confidence. Our consultants have worked closely with executives across the industry for more than two decades enabling them to leverage past work and provide practical and cost-efficient solutions. At Maritime Analytics, we work hard to help improve the profitability of our clients. Whether focused on short-term trades or long-term investments, we believe it is important to have a clear strategy, reliable market intelligence and robust risk management procedures in place. In a market dominated by structural cyclicality often masked by significant volatility, it is crucial to understand the underlying fundamentals at all times. The key to superior profitability in shipping markets lies in the organization’s ability to foresee and act upon structural changes in the demand and supply balance. Leveraging the industry’s best market data and models, we offer timely and unrivaled insight into shipping market developments. Shipping investments may offer substantial returns, but they also carry considerable risks. Securing and maintaining long-term competitive advantages in fleet composition and cost are some of the greatest challenges investors face. We offer a unique insight into current, past and future investment opportunities allowing for consistent evaluation and comparison. Modern shipping professionals are increasingly focused on prudent risk management. Whether a shipowner, cargo owner, financier, charterer or trader, properly handling the risk inherent in both physical and paper markets create confidence and trust for all stakeholders. 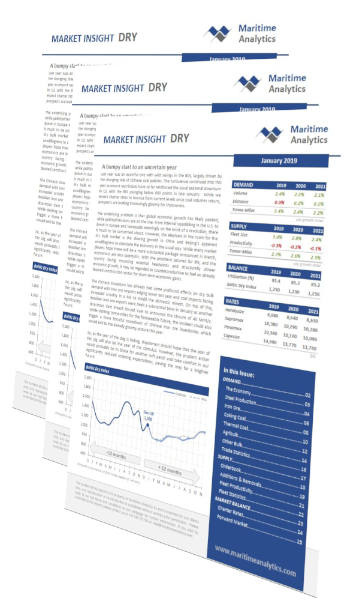 Our “Market Insight DRY” series is an invaluable tool for anyone exposed to the changing tides of the dry bulk market. The reports provide a monthly overview of key developments in the major seaborne commodities and the dry bulk fleet. We highlight important trends in the underlying market drivers and project the most likely future developments. Charter rate outlooks are provided for the four ship types specified by the Baltic Exchange. We base all our research on proven market models, capturing the entire demand/ supply balance since 1990. This allows us to understand, quantify and predict the drivers of charter rates in detail. If you want to subscribe, learn more about our services or to receive a free sample report please contact us. Established in 2012, Maritime Analytics AS comprise a dedicated team of experienced shipping consultants and analysts. Our core areas of expertise are market research, investment strategies and risk management within the bulk shipping sectors. We focus on providing cost-efficient and solution-oriented advisory services to our clients by leveraging our portfolio of proven financial models. We also offer monthly market reports, which provide our clients with a unique market insight and an honest outlook. Based in Oslo, Norway, the company is 100% owned by its employees. As an independent entity, we provide unbiased advice to our clients. Our growing client base include ship owners, cargo owners, charterers, brokers, investors and financial institutions worldwide. Mr. Monsen – a co-founder and managing partner of Maritime Analytics AS, focuses on market and strategic evaluation for our international client base. He has been an executive level advisor to the industry for more than 25 years. As a shipping consultant, he has been responsible for large-scale projects for financial institutions, oil companies, investors and major ship owners worldwide. His extensive experience covers board level strategy and risk management counseling including market timing and investment opportunities. Monsen has worked closely with shipping executives in Europe, United States and Asia for over two decades and has acquired an in-depth understanding of the market dynamics in the dry bulk and crude oil transportation sectors. Mr. Monsen holds a BS degree in business administration from the University of Denver, Colorado. Mr. Urstad is one of the co-founders of Maritime Analytics AS and he is currently responsible for our market research department. He has worked as an advisor to the shipping industry for 15 years and has extensive experience in shipping strategy and advisory work. 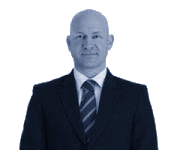 Mr. Urstad has led a number of strategy projects for international ship owners, cargo owners, charters and operators and he is advising investors on deal screening, transactions and portfolio management. 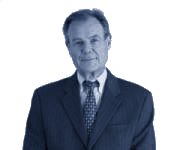 Over the years, Mr. Urstad has been responsible for developing and implementing a number of financial models used for investment evaluation, trading strategies and risk management. Many of these models remain in daily use at some of the largest player in our industry. Mr. Urstad holds a M.A. (hons) degree in Finance from University of Strathclyde where he majored with a thesis on financial option pricing.